Natural zones of hybridization between species offer the opportunity to investigate early stages of the speciation process. Eastern and Western European house mice (Mus musculus musculus and M. m. domesticus) meet in a narrow hybrid zone in central Europe, running from Bulgaria to Denmark. The hybrid zone is well characterized; patterns of gene flow have been analyzed in detail across multiple transects and multiple ecologically relevant traits measured, including parasite load, mate choice, fertility, and gut microbiota (e.g. studies from Nachman, Tucker, Macholan, Pialek, Baird, Ganem, Baines labs). In collaboration with Bettina Harr (MPI-Plön), I am investigating the genetic basis of hybrid male sterility, a key reproductive barrier between house mouse subspecies, using mice captured from the hybrid zone in Bavaria. We have shown that ~30% of male hybrids show evidence for reduced fertility, but the type and severity of sterility phenotypes varied widely. To identify genetic variants causing sterility, we performed a genome-wide association study (GWAS) and identified genomic regions and interactions contributing to variation in testis weight and genome-wide testis gene expression. Currently, we are using population genomics in wild mice from pure subspecies populations to look for signatures of positive selection acting on sterility regions. I am breeding a panel of inbred strains derived from hybrid zone mice (see Resources), in which I will functionally characterize candidate genes in the sterility regions. Turner LM, Harr B. 2014. Genome-wide mapping in a house mouse hybrid zone reveals hybrid sterility loci and Dobzhansky-Muller interactions. eLIFE 2014;3:e02504. Insight: Phifer-Rixey M. 2014. Searching for the genes that separate species. eLife 2014;3:e05377. Turner LM, Schwahn DJ, Harr B. 2012. Reduced male fertility is common but highly variable in form and severity in a natural house mouse hybrid zone. Evolution 66 (2): 443-458. Recently developed systems genetics approaches integrate large-scale measurements of genotype, gene expression, and phenotype to reconstruct gene networks. Comparison of networks under different conditions can reveal the mechanistic basis of phenotypes. Hybrid dysfunction is often caused by negative epistasis between loci – so-called Dobzhansky-Muller incompatibilities. The central importance of interactions predicts disruptions in gene networks will be associated with hybrid defects. Adopting a network perspective to investigate hybrid sterility in house mice has revealed features of the genetic architecture that would have been difficult to ascertain using a gene-by-gene approach. 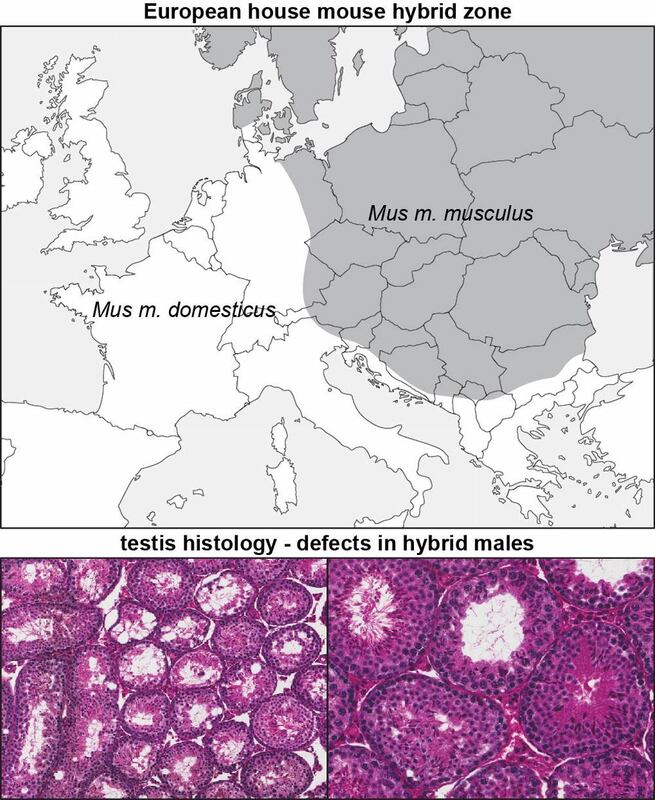 As a postdoc in Bret Payseur’s lab (University of Wisconsin), I mapped testis gene expression patterns in F2 hybrids from a cross between M. m. musculus and M. m. domesticus inbred strains and identified genomic regions causing major disruptions in expression associated with sterility. Using a conditional mapping approach motivated by the Dobzhansky-Muller model, I identified genetic interactions affecting expression patterns. This was one of the first genome-scale descriptions of a Dobzhansky-Muller interaction network, and revealed general features of the architecture including the number, type, and independence of incompatibilities. The interaction network inferred from the GWAS in hybrid zone mice was similar in structure to the network in F2 hybrids. Moreover, there is remarkable co-localization of some of the sterility loci and interactions identified in hybrid zone mice and F2s, suggesting there are common genetic factors underlying sterility. I am currently comparing gene co-expression networks in sterile and fertile subsets of individuals within and between these mapping populations to characterize the nature and scope of disruptions caused by hybrid incompatibilities. Turner LM, White MA, Tautz D, Payseur BA. 2014. Genomic networks of hybrid sterility. PLoS Genetics 10(2): e1004162. Spermatogenesis involves many developmental processes occurring over ~32 days. To identify genetic mechanisms responsible for hybrid sterility, it is necessary to identify the location, stage and process where defects occur. I am characterizing spermatogenesis defects in hybrids across a developmental time course from the initial onset of meiosis through sexual maturity, using histomorphology, immunolocalization, gene expression analyses, and genome-wide methylation profiling. Using results from the time course, I will prioritize candidate genes within the sterility regions identified in hybrid zone mice and F2 hybrids for functional analysis. Ultimately, I plan to use genome editing to directly test effects of alleles on different hybrid genomic backgrounds. Currently, I am characterizing congenic strains carrying sterility alleles from a wild derived M. m. domesticus strain on chromosomes 2 and 10, identified in F2 hybrids, backcrossed onto a M. m. musculus strain. I will use the same approach to characterize hybrid zone inbred strains (see Resources). The approaches I am taking to investigate sterility in hybrid zone mice are useful for mapping other quantitative traits. I am collaborating with Diethard Tautz’s group (MPI-Plön) to map morphological traits and with John Baine’s group (Christian-Albrechts-University and MPI-Plön) to map gut microbiome phenotypes in hybrids. I plan to follow up on candidate regions identified for these traits using fine mapping and functional characterization in the hybrid zone inbred strain panel (see Resources). Wang J, Kalyan S, Steck N, Turner LM, Harr B, Künzel S, Häsler R, Franke A, Grassl GA, Kabelitz D, Baines JF. 2015. Analysis of the intestinal microbiota of hybrid house mice reveals evolutionary divergence in a vertebrate hologenome. Nature Communications 6:6440. Pallares LF, Harr B, Turner LM, Tautz D. 2014. Use of a natural hybrid zone for genome-wide association mapping of craniofacial traits in the house mouse. Molecular Ecology 23(3): 5756-5770.